MGM Studios fed Judy Garland a chicken soup diet to keep her weight down. At meal times during a break in shooting, a small bowl of soup was served to her in the MGM cafeteria. Hamburgers, steaks, pizzas and basically any foods with high meat and fat content was a big no-no for Miss Garland, it always had to be soup. Judy Garland was naturally chubby as a child, and the studio didn't want to have a chubby star so that was the reason behind her controlled meals. If that didn't keep her weight down then she was given diet pills. In her later life, she said that she missed eating while growing up. A very sad and sorry story behind a wonderful actress in Judy Garland. Aint nothing wrong with a cheeseburger ;). They didn't have McDonald's in the days of The Wizard of Oz. It goes to show how old the movie really is. So old, yet so timeless. 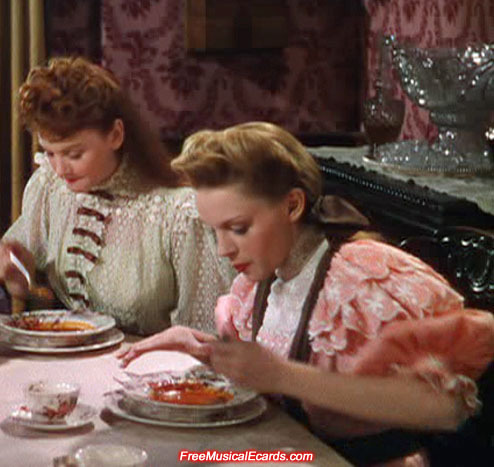 The attractive Judy Garland as Esther (in pink dress) and Lucille Bremer as Rose played sisters eating soup in "Meet Me in St. Louis", a funny 1944 musical film that everybody should not miss. Judy Garland was already one of MGM's biggest movie stars at the time, while Lucille Bremer made her movie debut. Oh My Lord! She looked malnourish in this picture. She's 24 years of age during this time? 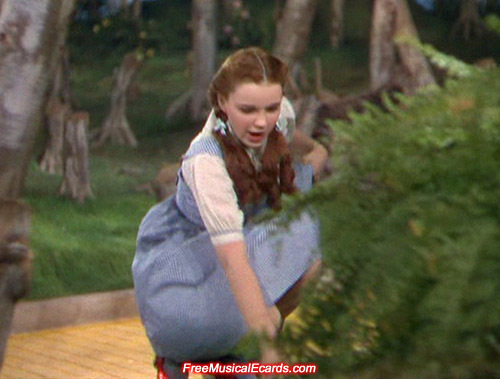 Actually, Judy Garland was in good shape during this time of her life. She was 21 years old during filming, and 22 years old when it was released.